Silk Road Overland Route - HISTORY'S HISTORIESYou are history. We are the future. Dunhuang, always considered a pearl of the Silk Road, is the point at which the overland route divides into three separate paths heading west. 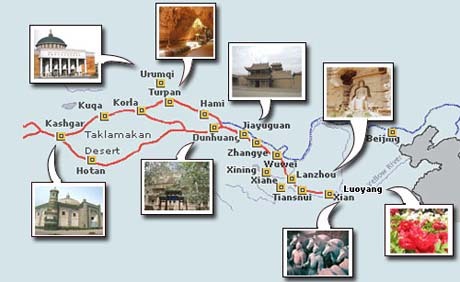 The overland Silk Road route to the began in Chang 'An, the capital of China during the Han, Qin and Tang dynasties. From there, it headed west stopping in the towns of Zhangye, Jiayuguan, Langzhou, Yumen, Anxi and Nanhu before dividing in three main routes at Dunhuang. ​The three main routes between Dunhuang and Central Asia were: 1) the northern route, which went through northwest China through the towns of Hami and Turpan to Central Asia: 2) the central route, which veered southwest from Turpan and passed through Kucha, Aksu and Kashgar; and 3) the southern route, which passed through the heart of the Taklamakan Desert via the oasis towns of Miran, Khotan and Yarkand before joining with the central route in Kashgar. On the southern route through western China travel began to get difficult near present-day Langzhou. It's there that the traveler approached an area that featured "rushing rivers, cutting their way through sand...an unfathomable lake hidden among the dunes...sand-hills with a voice like thunder" and "water which could be clearly seen and yet was a deception." It is from that "voice like thunder" that the area earned its nickname, the "gate of Demons." Kashgar remains a bustling market today. If the Silk road traveler was brave enough to continue past the "Gate of Demons" their journey then started to get really rough around Xingxing Xia, also known as the "Ravine of Baboons." Xingxing Xia is a ravine between the mountains that lead to the Taklamakan Desert. The name literally means "star gorge." As with the "Gate of Demons," Xinxing Xia's nickname derives from the howling voices carried in on the wind that got channeled through the ravine at night. Traditionally, the "Ravine of Baboons" is regarded as the frontier of Chinese Turkestan and serves as an entrance to the vast and inhospitable Taklamakan Desert. This area has been described as a howling wilderness where the first thing which strikes the wayfarer is the dismal nature of its black, pebble-strewn surface. After the Ravine of Baboons, the Silk Road followed a line of oases to Kashgar. The Silk Road routes in this area were very complicated and usually defined by oases through passes which were open and accessible. Many goods carried across Central Asia were transported on the backs of shaggy, two-humped Bactrian camels or horses, or, in the high elevations, on yaks. The Himalayan caravan routes from India that passed through Karakoram Pass and Khunjerab Pass, on the modern Karakoram Highway, joined the Silk Road in Kashgar or Central Asia. The two main routes that entered Central Asia from China were: 1) the southern route which left Kashgar and passed from western China in Central Asia through passes of the Tien Shan and Pamirs mountains that are now on China's borders with Kyrgyzstan, Tajikistan and Afghanistan; and 2) the northern route, which passed from western China into what is now Kazakhstan and went through or near what is now Alma Aty (Kazakhstan), Bishkek (Krygyzstan) and Tashkent (Uzbekistan). If one took the northern route, they would pass through one of the grandest cities in all of antiquity, Samarkand. The main route likely passed from Kashgar through Irkeshtam Pass between Kashgar and the Fergana Valley in present-day Uzbekistan. Marco Polo used a route through the Pamirs between China and Afghanistan. 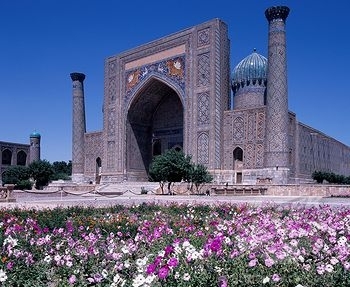 The ancient town of Samarkand is one of the true jewels of antiquity. From Samarkand the main Silk Road route heading west passed through Bukhara (Uzbekistan), Merv (Turkmenistan), Mashad (Iran), Hamadan (Iran) to Baghdad. From Baghdad some traders traveled to the Mediterranean port of Tyre via Palmyra, while other went to the Black Sea port of Trabzon through western Iran or on to Constantinople (Istanbul) via Turkey. To give you some idea of how changeable, complicated and confusing the Silk Road was, Marco Polo went to hardly any of the places most commonly associated with the Silk Road in Central Asia and the Middle East and it took him 17 years to go from Italy to China and back.